It's like Phyllis Diller's new face, Henny Youngman's new shape and Sammy Davis' new politics. 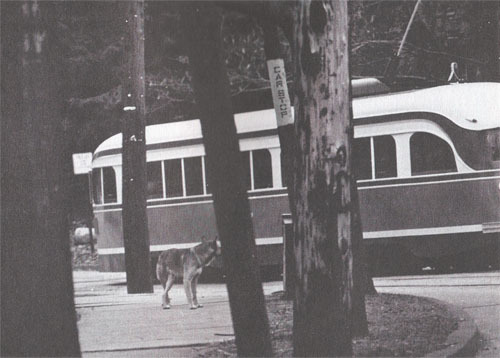 That's how astounding is the big change in dear old trolley cars 2565 and 2168, circa 1942 and 1948. They have had their under-sides (motors, trucks, etc.) overhauled, their windows and wiring replaced, their bodies strengthened, their insides refurbished top to bottom, and their outsides painted in bright, eye-popping color combinations. All this work could give each car as many as ten more years of service ... and it has provided much design and technical information as SEPTA looks toward writing specifications for new cars (which could cost $100,000 each even as part of a package deal in cooperation with a couple of other transit authorities). But perhaps, in psychological impact, these vehicles are more fun than just-off-the-assembly-line models. After all, new is merely new, but seeing something so old looking so young is uplifting -- even for old-timers who do battle with falling-apart trolleys every day. That's nice, you say, but will the new look hold up? You have your finger on one major purpose of the project. Yes, we are assured that the exterior paint by Urecal Corporation is of such quality that, with a little maintenance, it will show very little change in color or lustre for seven to ten years! The trolleys' inside decor is by Westinghouse. There is very little paint because the ceilings and sides are panelled with a substance called Micarta over U.S. Plywood panels. Micarta is highly resistant to the miserable materials so loved by graffiti freaks. Even the seat covers are graffiti resistant. Other improvements include seats re-upholstered in vinyl, floors of London Transport's slip-resistant aluminum oxide, new Translite incandescent lights, Teflon coated wiring, and passenger windows of vandal resistant GE Lexan polycarbonate glazed with MR 4000. And everybody knows what that is, right? After inspecting the cars, experiencing that "uplift," and imagining how great it would be to outsmart the kids who labor so hard to keep us ugly, we assigned 2565 (painted super-bright orange, blue and white) to Route 13, Woodland Depot, and we sent 2168 (gold, plum and white) to Route 56, Luzerne Depot. We also decided to survey riders to see if the project would make a good, positive difference to them. Almost everybody asked filled out a form and those who did liked the car (2565). 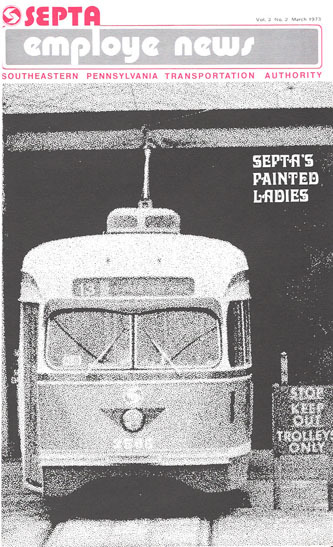 Other comments included: "Glad SEPTA is making an effort to find out what people want." "Make all trolleys like this one." "Fat people who take up two seats should pay double fare." "Use metal seats to stop vandals from cutting up coverings." "Better trolleys are nice -- but more trolleys are nicer." And one final word of encouragement from a young man, "Keep truckin'." Have you ridden one of the cars? If so, we'd like to hear what you, as a mass transit worker, think about them. Send your comments to Editor, SEPTA Employe News, Wyoming. 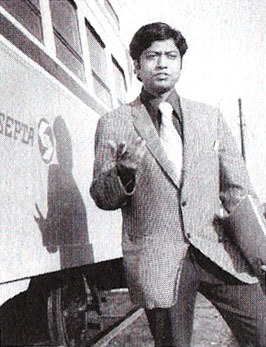 Amit K. Bhattacharyya, who came to SEPTA from India in January, 1972, is called a "Transportation Systems Engineer -- Rapid Transit." While our two special trolleys were being rebuilt (see above) Amit was "Project Engineer." He picked up his name in his place of birth, Calcutta, India where he also began the training and experience that have given him so much authority in a short time. He holds a Bachelor of Science degree in Electrical Engineering from Jadavpur University (1967), and has graduated from a Fortran IV Programming course in Calcutta. In the Philadelphia area he has taken courses toward his Masters degree in Electrical Engineering at Drexel and is now taking Masters courses in Transportation Engineering at Villanova. Bhattacharyya has noted a few of the many who worked on the cars. "At 69th Street, superintendent Joe Laughlin and electrician, George Guagenti. Also Herb McCook of Courtland Shop, Walt Stevenson of Wyoming Shop, Norman Marcus of Project Management, Hugh Radbill of RS&S, and Al Holeton, who designed the color scheme for car 2565."